DURHAM: Virginia Wilson Terry, 95, passed away Saturday, November 3, 2018. She was born in Mecklenburg County, Virginia, the daughter of the late Paul Wilson and Susie Hite Wilson. Virginia was preceded in death by husbands, Sidney Brown and Columbus Terry; and grandchild, George Williams. Virginia was baptized as one of Jehovah’s Witnesses on July 12, 1982. She enjoyed going out in the ministry and talking to others about the Bible’s Kingdom hope. Virginia truly appreciated spiritual things. Everyone that knew her saw the love she had for Jehovah God. Daniel 2:44; Matthew 6:9,10; Revelation 21:3,4. Virginia is survived by sons, Jesse Brown and wife Annette J, James Brown and wife Mary; daughters, Mildred Williams, Susie Brown-Williamson and husband Maceo, Virginia Thomas, Ada Moss Carrie Parham and husband Ellis; brothers, Vaughn Wilson and CV Wilson; sisters, Mildred James, Lula Johnson, Katie Batton; grandchildren, Curtis Williams and longtime companion Louise, Ronnie Williams and wife Shirley, Pearl Green and husband Larry, Robert Williams, Teresa Perry and husband Greg, Tonya Taborn, Jason Lamont Brown, Kenneth Ray Brown, Sammy G. Brown and wife Darlene, Jesse O. Brown and wife Belinda F., Kevin W. Brown, Sidney W. Brown, Dale O. Thomas and wife Betty, Sandy L. Thomas, Sidney C. Thomas and wife Juanita, Jennifer V. Thomas, Maria Thorpe and husband Joe, Fatima Meadows and husband Brandon, Carrie L. Johnson and husband John, Roy C. Moss and wife Amy, Ellisa Williams and husband Anthony, Bridget White and husband Bert, Tishri Gibson, Michael T. Brown, Yolanda Pulliam and husband Kenneth; and a host of great-grandchildren, great-great-grandchildren and great-great-great-grandchildren. Virginia was a member of several congregations of Jehovah’s Witnesses throughout the years. She was adopted as a spiritual mother and grandmother by many and was affectionately known as Granny. Those spiritual sons, daughters, and grandchildren will dearly miss her as well. A memorial service will be held at 11am on Wednesday, November 7, 2018 at Clements Funeral Chapel in Durham, NC. The family will receive friends from 6-8pm on Tuesday, November 6, 2018 at Clements Funeral Home in Durham, NC. To send flowers or a remembrance gift to the family of Virginia Wilson Terry, please visit our Tribute Store. 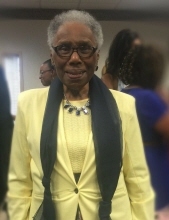 "Email Address" would like to share the life celebration of Virginia Wilson Terry. Click on the "link" to go to share a favorite memory or leave a condolence message for the family.